We are delighted to be able to offer for sale this gorgeous antique Edwardian pedestal desk dating from around 1890. Crafted in solid mahogany it is crossbanded with boxwood and ebony line inlay. 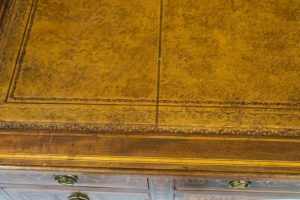 This antique Sheraton Revival desk has a tan leather writing surface with hand tooled gold leaf decoration. With seven drawers, comprising three in each pedestal and one central drawer, each drawer is lined in solid mahogany with hand cut dovetails. 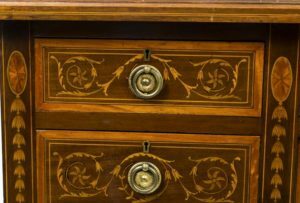 These drawers have the original circular brass handles and Cope & Collinson locks. 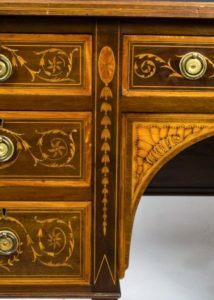 This Edwardian pedestal desk has been masterfully inlaid with marquetry that features garlands, shells and urns and which is clearly is the work of a master craftsman and is a delight to behold. This Edwardian pedestal desk has four tapering legs which are terminated with the original brass cap castors meaning that it can be easily moved around the room making it a very useful piece of furniture. The Sheraton Revival style typified by this lovely Edwardian pedestal desk began in England in the 1860s and by the 1880s the taste for the Sheraton style was firmly established with many of the fashionable furniture and cabinet makers offering copies of Sheraton influenced styles. Even Morris & Co started producing designs that were clearly influenced by Sheraton. To support the demand, Sheraton’s ‘Drawing Book’ was re-published in 1895 indicating just how popular this style was. 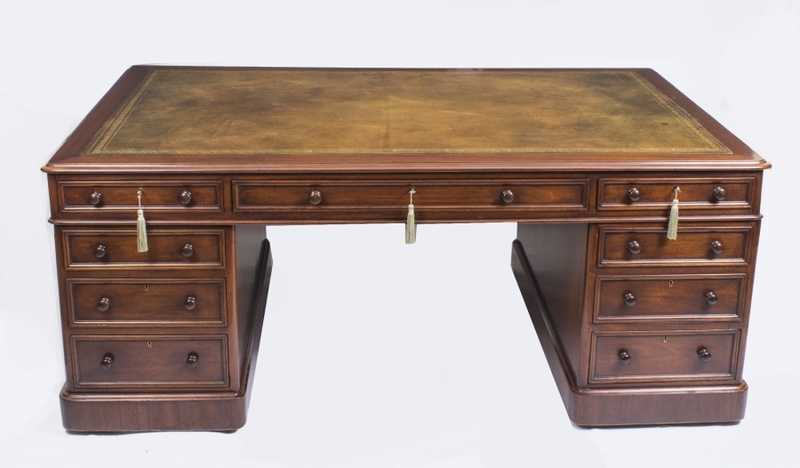 You can now bring the elegance and style of Sheraton to any room in which you choose to place this delightful antique Sheraton Revival desk. It is a very fine example of this style of furniture and is sure to be a talking point amongst friends and family. Equally it would make a fabulous addition to any workplace boardroom or client entertaining suite adding an air of sophistication and gravitas. 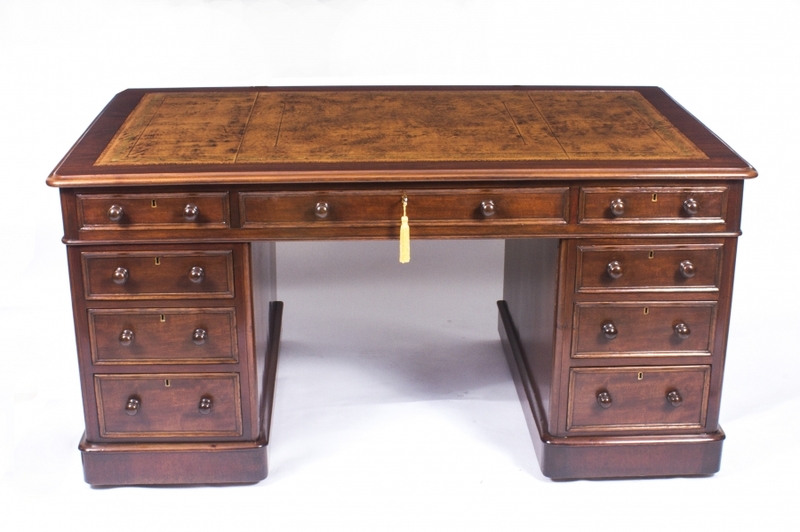 This antique Sheraton Revival desk is in a superb condition as can easily be seen in the photos we have supplied. Kindly take a few minutes to take a look at them and satisfy yourself of this. 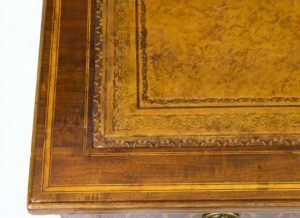 We’re confident you will agree that it’s a great idea to view this antique Sheraton Revival desk face-to-face before buying. 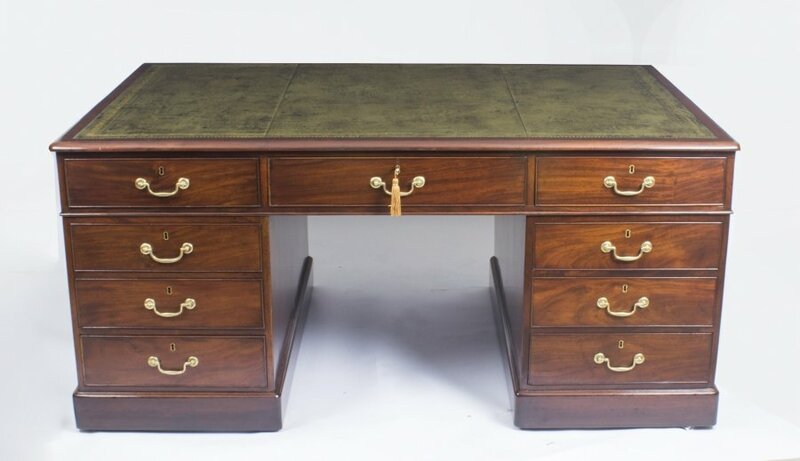 Considering this, we are really delighted to welcome you to travel to our North London display room to study this fantastic Edwardian pedestal desk for yourself. Whilst you are here you will also be able to go over our comprehensive range of other fabulous articles and also speak any considerations or problems that you could have. 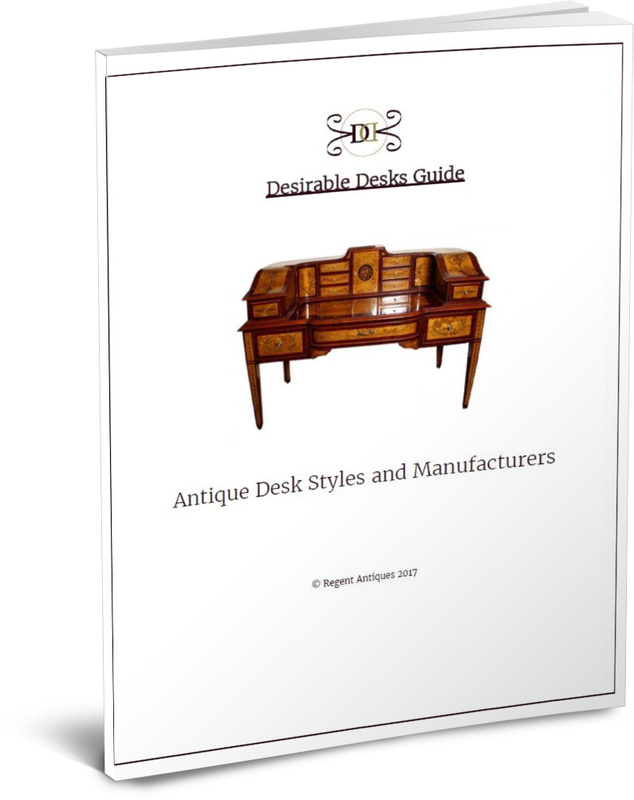 Our in house consultants are available to help answer queries, not only about this antique Sheraton Revival desk but also concerning antiques and collectibles more generally. They’ve got a good deal of knowledge and are always pleased to advise. Please call ahead of time so that we can be sure we have the right specialist around to help you. From time to time we open on Saturdays, so if you wish to come at a weekend, please get in contact in advance in order to ensure we will be open. We don’t want you making a pointless trip. You can find out details by clicking the ‘Find Out More’ button. 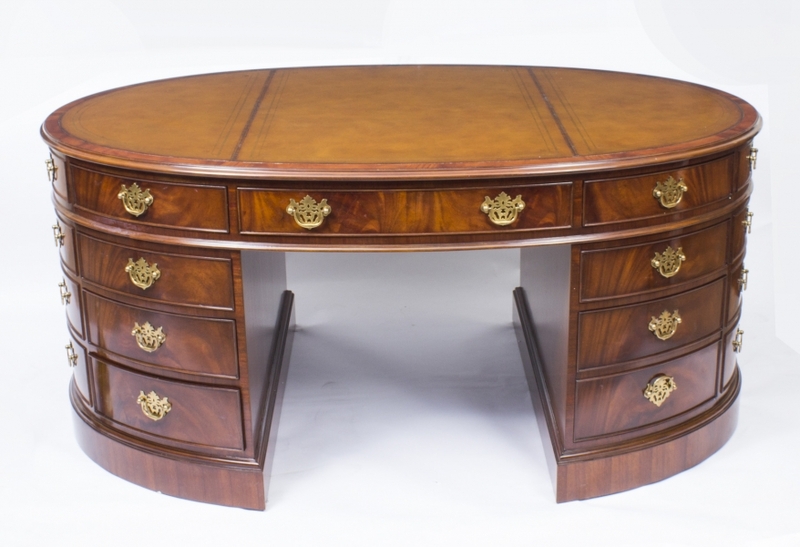 The London salesroom is open Mon to Fri 10am – 5pm for you to look at this antique Sheraton Revival desk. We also open sometimes on Saturdays – but please ring ahead before taking the trip on a Saturday as we really do not wish you to be let down. Find out how to get to us by clicking on the ‘Find Out More’ button. 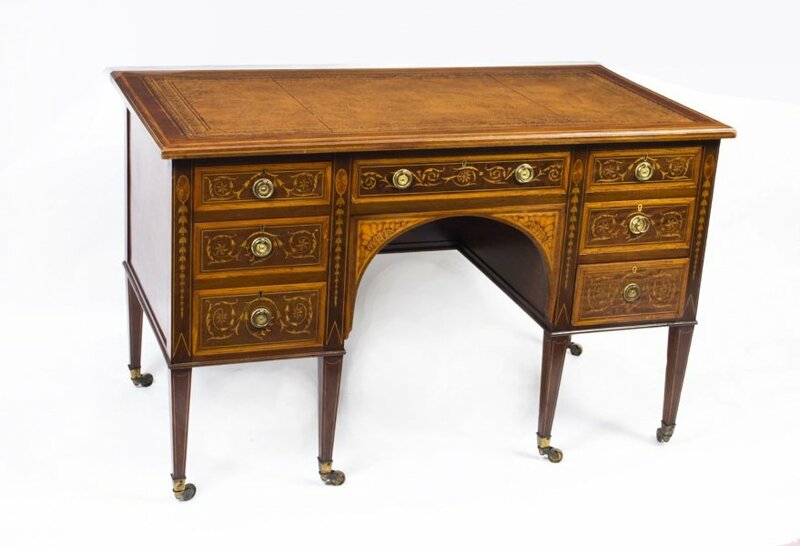 If you’re not able to pay us a visit, then we are always delighted to answer any queries you may have about this antique Sheraton Revival desk by email or telephone. We have in house consultants who will be happy to guide you through any aspect of your proposed purchase, so why not take the opportunity to gather more information. When you contact us please make sure to mention the item reference number (06664) so we know which of our numerous pieces you are speaking about. You can find both our email address and our telephone number by following the ‘Find Out More’ button. Fantastic pieces such as this Edwardian pedestal desk need expert packing and shipping to ensure they get to you in the exact condition that they left us. We take great satisfaction in our shipping know-how and can deliver to pretty much any location worldwide. However, we ask you to get in contact to talk about transport arrangements and obtain a quote prior to making any purchases, as we will need to be sure that we can satisfy all your shipping requirements. As you will understand, some articles call for delicate handling and we will need to make sure that everything is in position to get it to you safely. 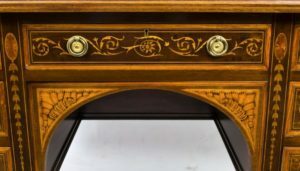 Please quote the item reference number for this antique Sheraton Revival desk when getting in touch so we know precisely what the shipping requirements will require. You will be pleased to know that shipping is free to any mainland UK destination. 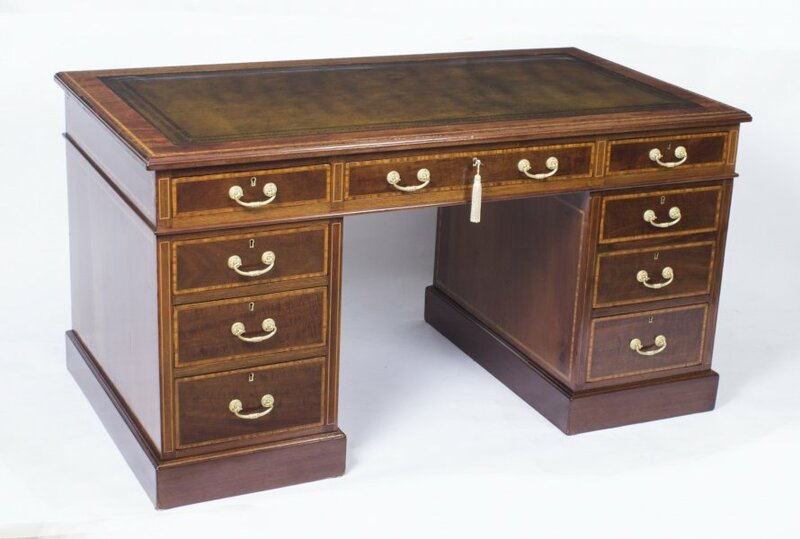 If you are not pleased with this antique Sheraton Revival desk, we have a 14 day money-back guarantee in conformance with the Distance Selling Regulations. If you do want to return it, you will have to pay the return shipping charges, unless we sent you an item materially different to what you were expecting or have mis described it in some material way. You must send the article back in its’ original condition and packaging. You’re also liable for any customs duties, taxes or fees that become due outside the European Union.